The poet Persimmon Gaunt and the thief Imago Bone had sought only to retire from adventuring and start a family, but they never reckoned on their baby becoming the chosen vessel of the mystical energies of a distant Eastern land. With their son Innocence hunted by various factions hoping to use him as a tool, they kept him safe at the cost of trapping him in a pocket dimension of accelerated time. Now free, the thirteen-year-old Innocence has rejected his parents and his "destiny" and has made dangerous friends in a barbaric Western land of dragon-prowed ships and rugged fjords. Desperately, Gaunt and Bone seek to track him down, along with their companion Snow Pine and her daughter A-Girl-Is-A-Joy, who was once trapped with Innocence too. But as the nomadic Karvaks and their war-balloons strike west, and a troll-king spins his webs, and Joy is herself chosen by the spirit of the very land Innocence has fled to, Gaunt and Bone find themselves at the heart of a vast struggle -- and their own son is emerging from that conflict as a force of evil. 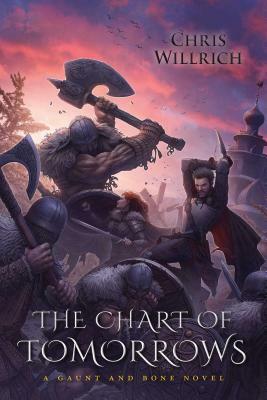 To save him and everything they know, they turn to a dangerous magical book, The Chart of Tomorrows, that reveals pathways through time. Upon the treacherous seas of history, Gaunt and Bone must face the darkness in each other’s pasts, in order to rescue their future. Chris Willrich is a science fiction and fantasy writer best known for his sword-and-sorcery tales of Persimmon Gaunt and Imago Bone. He is the author of The Scroll of Years, The Silk Map, and The Dagger of Trust. Until recently he was a children's librarian for the Santa Clara County Library System, in the San Francisco Bay Area. His work has appeared in Asimov's, Beneath Ceaseless Skies, Black Gate, Fantasy and Science Fiction, Flashing Swords, The Mythic Circle, and Strange Horizons.